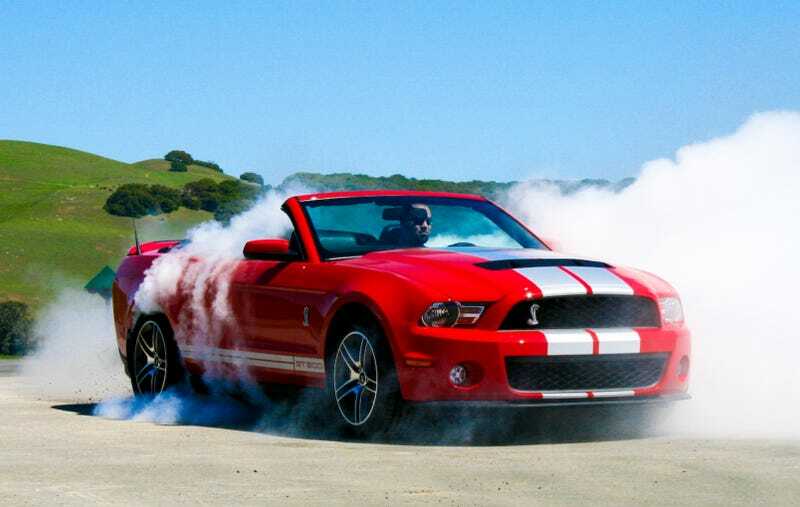 With the 2010 Shelby GT500, SVT's engineers claim they've turned a 500 HP Mustang into a 540 HP super car. They've succeeded, but don't worry; it'll still do enormous burnouts. Like the 2010 Ford Mustang GT, this new GT500 isn't an all-new car, but rather an extreme development of the previous platform. That old 2007 Shelby GT500 set the world alight with its 500 HP, 480 Lb-Ft 5.4-liter supercharged V8, offering an unprecedented level of straight line performance — running the quarter mile in the low 12-second range — for just $41,675. But it was a one trick pony, floating with dangerous imprecision around corners and offering very little feel on its way to spinning at the slightest provocation. Driving that car was an exercise in point and shoot: slam on the brakes, drive slowly around the corner, then stomp on the gas once the steering's pointed straight. According to both Ray and Ford representatives, I'm the only person in the world who actually liked its kill-you-at-the-slightest-mistake personality. This 2010 model couldn't be any more different. Starting with the $79,995 2009 Shelby GT500KR, Ford's SVT engineering team set out to make a friendlier, faster package that could defy its muscle car roots and genuinely compete, in more than a straight line, with real super cars costing many times its $48,175 price tag. Compared to its predecessor, the new GT500 gains stiffer springs both front and rear along with firmer damping, intended to reduce roll in corners, dive under braking and squat under acceleration. New 19" wheels and bespoke Goodyear F1 Supercar tires boost grip. Revised aerodynamics mean downforce is up and drag is down. Thanks to a cold air intake and other tweaks, power and torque are up 40 HP and 30 Lb-Ft, respectively. Combined with a change in rear differential ratio from 3.31 to 3.55 and longer fifth and sixth gears, acceleration is improved from 4.6 to 4.3 seconds to 60 MPH and fuel economy on the highway is boosted 2 MPG to 22 MPG. We didn't get 22 MPG while driving the 2010 GT500. There's two approaches you can take to going fast in this Shelby: work hard or take it easy. The first is more fun; take advantage of the new-found control to finish shedding the immense speed as you enter a corner, hit the redline downshifting, get on the throttle, use the power to get the front end around then bounce off the rev limiter before grabbing another gear. It's a dramatic approach that would have sent you off the road in the old car and it'll still scare the crap out of your passengers. That 540 HP is now eminently exploitable thanks to the increased grip and greater feel, but it arrives at 6,200 RPM, just 500 RPM before the redline, meaning it's difficult to blend gears together up-shifting under maximum acceleration on the road. That's not made any easier by the short shift on this Tremec TR6060 6-speed; already a somewhat notchy gearbox, the newly lost length in throw can make shifts slower than you'd hope, blunting otherwise outrageous acceleration. The other way to drive the GT500 is by taking advantage of the 510 Lb-Ft of torque, which peaks at 4,500 RPM, to hold a gear higher than you'd normally think possible at this pace. Driving smoothly like this is probably faster, taking advantage of the new-found grip and composure to tackle corners smoothly, but still incredibly quickly. This is now more than just a muscle car, its A-to-B mountain road pace has just moved up with some of best AWD cars — the GT500 can exploit its all-conquering power just as competently, but with a bit more drama. Part of that much-increased ability is down to Ford's new AdvanceTrac stability control system. Combined with the new clutch — a very light throw, but it engages too far up the stroke — AdvanceTrac makes the GT500 a very friendly car; you could now safely lend it to a less-than-talented driver and stand greater than 50:50 odds of seeing it in one piece again. Like many similar systems, AdvanceTrac has a "Sport" mode that's a good halfway house between the no-fun, fully-on mode and the you'd-bettter-be-paying-attention, fully-off. Sport allows a reasonable amount of slip from either front or rear wheels before reining them in to boost speed and safety. The system even helps avoid understeer, to which the chassis is now biased. Turn everything off and throw the GT500 into a corner too fast and it'll push the front. Trail braking or stomping on the gas will, of course, counteract this; at which point the slide is still controllable with hefty application of countersteer. For a 540 HP, RWD car, this new Shelby is is a baby, both forgiving and easy to drive fast. That new control isn't apparent on the drag strip. On a cold, greasy strip, into a 20 MPH headwind, this drag racing neophyte wasn't able to turn in a time faster than 13.7 seconds. Despite the standard launch control — run through AdvanceTrac, so it's on if the system is — and even with traction control switched on, I couldn't stop the rear wheels spinning up under full throttle all the way through third gear. Experienced racers were able to turn in 12.3-second figures, which were very impressive given the conditions. Without AdvanceTrac the result was more dramatic, but much slower. It's hard to get this far into a review of a Mustang without talking about the live rear axle. The 2010 Shelby GT500 still uses one. It's this piece of throwback mechanical componentry that critics center their anti-Mustang arguments around and that Ford inexplicably continues to use, even at this price point. While the live rear axle still does define the Mustang's unique character, it doesn't appear to provide much limitation now that the rest of the package is so refined. You can see it jumping up and down underneath the rear when the GT500 runs the 1/4 mile and you can feel it spinning away back there in corners, but you'll be more focused on using the excellent steering feel and adjustable chassis to care. In fact, the only place where that live rear axle rears its ugly head is while doing burnouts; axle tramp is still so incredibly violent you'll be convinced you've broken the car every time the rear wheels spin up for more than three seconds. Now though, despite the new power, the GT500 isn't likely to find itself doing that unless you really want it to.